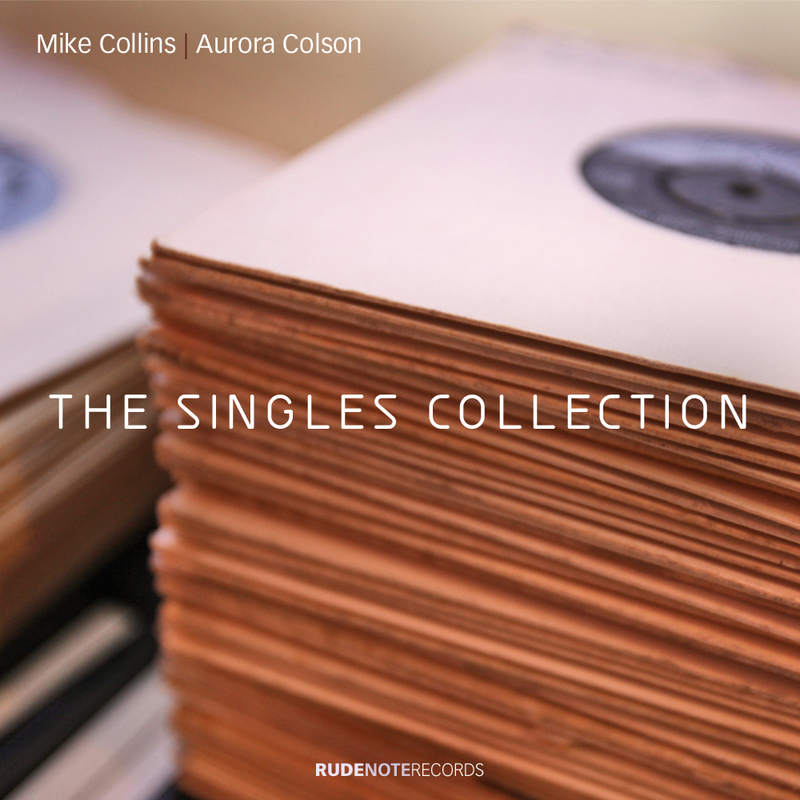 Featuring the vocal talents of Aurora Colson accompanied by Mike Collins and his various musical friends, this EP features ‘covers’ of classic pop hits from the 60’s and 70’s, two classic ‘seasonal’ offerings, and a tribute to Amy Winehouse. I worked on recording sessions in London back in the 80’s with keyboard players Keith O’Connell and Damon Butcher, with sax players ‘Snake’ Davis and Jamie Talbot, and with bass player John McKenzie. In the early 90’s, John McKenzie introduced me to drummer Blair Cunningham who, ten years later, became an important collaborator and co-writer. In 1998, I started a series of creative collaborations with Jim Mullen that is really starting to ‘bear fruit’ since I launched Rude Note Records with the release of three instrumental albums on the label. The arrangement for “It’s Too Late” started out as a demo session in Y2K with programmed bass and drums. Real bass and drums and other instruments were added in 2004 for an instrumental version that featured saxophone. The vocal version was developed in stages, with overdubs of harp, guitar and new bass guitar in 2010. New drums and a saxophone solo, bottleneck guitar and harmony vocals were recorded in 2011 until the final version was mixed in September of that year. Guitar and vocals for “Fortune Teller” were recorded in November 2010, with drums, electric guitars and more vocals added in April 2011. Because there were so many overdubs and so much comping and editing needed, this took about a week to record and mix by the time it was completed. On the other hand, “Light My Fire” and “Love is a Losing Game” both came together very quickly – each taking maybe a day or so to record and mix. “White Christmas” started off in 2004 as a basic sketch, but the full arrangement was not completed until Christmas 2008 – with Noel McCalla singing. It was not possible to release this at that time, and a further unreleased mix with a Wurlitzer electric piano overdub was made for Christmas 2009. When Aurora heard the arrangement, she loved this so much that she asked if she could sing a version for Christmas 2011. After a hectic few days recording vocals in both English and French, with a new guitar solo and even some steel drums in the middle section, two mixes were finished in time for release early in December 2011 – one first sung in English then in French, the other, included here, with French lyrics throughout. “Auld Lang Syne” started out as an instrumental version for which Aurora recorded a guide vocal. Initially, she did not want to sing this song, but when she heard the full arrangement, with Mike expertly ‘doubling’ her vocal using ‘bottleneck’ guitar, she changed her mind! After adding vocal harmonies at the end, Aurora suggested using these as an acapella introduction, and this worked out just great! This all took about two days or so to record, at a number of sessions between November 1st and December 19th – just in time to release for New Year’s Eve 2011. Click here to listen to this on Soundcloud. Written by Allen Toussaint under the pseudonym Naomi Neville, “Fortune Teller” was first recorded by Benny Spellman in 1962. Michael plays all the instruments on this version, including acoustic and electric guitars, bass guitar and various hand percussion instruments, with Aurora joining in on handclaps. Graham Dean plays drums on this mix. Michael and Aurora both sing the lead and backing vocals along with the ‘whoops and hollers’ and vocal effects. Are you ready for this? A ‘no-holds-barred’, funky, slamming, jamming version of the Doors classic song, “Light My Fire”, featuring sultry vocals from Aurora Colson with ‘hot’ lead guitar licks and solos from Jim Mullen! Amy Winehouse wrote this poignant song about how she wished she had never played the game of love because she made such a mess of it – many of us would feel the same way! Mike originally recorded this as an instrumental tribute to Amy Winehouse, playing guitars, bass and several hand percussion instruments. Later, Winston Blissett and Marc Parnell added bass and drums and Mike invited Aurora to add vocals – enjoy! This is a ‘foot-tapping’ jazzed-up version of the classic Irving Berlin song, “White Christmas”, sung by Aurora using the French lyrics for “Noel Blanc” written by Francis Blanche. Jim Mullen plays the jazzy guitar – with Roger Beaujolais on vibes, Winston Blissett on bass, Blair Cunningham on drums and a guest appearance from Bill Mudge on Wurlitzer electric piano. Mike plays pedal harp, percussion, accordion and the guitar solo in the middle section – which also has a ‘cameo’ appearance by steel drums player Samuel Dubois. On this recording, Clive Mellor plays great blues harmonica; Mike plays the main rhythm guitar parts on acoustic and electric guitars; Jay Stapley plays the ‘power’ chords on electric guitar; Jim Mullen plays several supporting guitar parts; Winston Blissett plays bass guitar and Marc Parnell plays drums.